Sam Sam grew up in Southern California. She learned about tall ships as a high school student aboard the Tole Mour and has been involved in boats ever since. This is her third season working for Adventuress, having filled the Relief Engineer position last Spring and Second Mate this Spring. Sam Sam has completed maritime Basic Safety Training, is an AB and a Wilderness First Responder as well as being CRP and First Aid certified. Her most recent accolade is a shiny new captain's license. Sam Sam hopes her next adventure to be working for the Foreign Service. If that doesn't happen then she plans to apply to International Relations graduate programs in the Fall. Sam is from the distant, exotic land of Yorktown Heights, New York, and has a B.S. and M.S. in oceanography from Cornell University. He is excited for his second season working aboard the Schooner Adventuress after working as the relief engineer last year. Sam has also sailed aboard the Clearwater, Mystic Whaler, and Robert C. Seamans, and has seen hundreds of other boats. Sam's favorite pastimes include performing improv and stand-up comedy and looking at restaurant menus prior to going to restaurants. Faran currently lives in Seattle,WA. They earned a B.A. in Biology from Lawrence University with minors in Anthropology and Neuroscience. Faran spent the last year cooking delicious French food at Boat Street Kitchen in Seattle and is excited to bring these fresh flavors to everyone aboard Adventuress. When they were a child, Faran thought their mood controlled the weather and the tides, and still thinks it could be true. Hailing from Puyallup, Evan holds an Associates Degree in Telecommunications from Bates Technical College and has been putting it to use working on new construction sites for Amazon and Microsoft. He discovered sailing after taking his father to a Tall Ship Festival in Tacoma last year and totally fell in love with it. After sailing on the Adventuress he decided he really wanted to get involved and volunteered during each Winter Maintenance Weekends. He feels very fortunate to be offered the opportunity to be crew, and is looking forward to sailing and educating youth, hoping to make a positive lasting impact on their lives. Fun fact: Evan spent two years traveling the US for work in a work van, visiting a total of 39 states and numerous retired Navy ships. Sean grew up in Little Rock, Arkansas and studied Environmental Science, Wildlife Habitat Management and Entomology at the University of Arkansas. He started sailing and racing 24' vessels on Arkansas lakes. Sean served as a Deckhand on S/V Seaward in San Francisco and S/V Liberty Clipper on the East Coast. Most recently he held the position as First Mate aboard S/V When And If and sailed over 10,000 nm with her in the last year. He is extremely excited to sail in the Pacific NW! Taylor hails from beautiful Bainbridge Island in Washington. She earned her degree in Marine Biology from the University of Hawaii at Manoa in 2015 and has since been working at a variety of outdoor schools and on tall ships all over the country! Even though she calls Washington home, Taylor's ideal place to live is the North Maine Woods. Gray grew up in Baltimore, and just completed their B.S. in Marine Biology at Northeastern University. This is Gray's second season onboard. Prior to this, they were a Program Director at Sail Caribbean in the British Virgin Islands. Gray dreams of being a master clawhammer banjo player. Kevin is a proud cheesehead from southeastern Wisconsin. He graduated in 2015 from the University of Wisconsin - Madison with a BA in Zoology and Environmental Studies. He has spent the following two years living in Naples, Florida as a naturalist for the Conservancy of Southwest Florida, where he had a variety of crazy jobs ranging from teaching kids how to snorkel to target training baby alligators. Christina is an island girl, born and raised in Maui, Hawaii. She stayed in Hawaii for school to pick up a BS in Marine Science (with a chemistry minor and a Marine Option Program certificate) and has been working on another island -- Catalina Island-- for the Catalina Island Marine Institute as a marine science instructor at Camp Fox. Danny recently graduated from Warren Wilson in North Carolina, with a degree in Chemistry and Environmental Studies. He's originally from the South-West of France and has lived there for the first 18 years of his life! Danny's last job was as a Independent Research Consultant for the NASA Develop Program. He worked on a livestock farm at the same time as his NASA job, which was a great combo! Chloe is currently living in Haines, Alaska and has a Bachelor's Degree in Animal Sciences from the University of Missouri. Most recently she has worked as a baker at the Rusty Compass Coffeehouse and walks dogs for a side job. Chloe also volunteers at the local radio station and the animal rescue service. Anna grew up on Vashon Island, Washington and currently lives in Walla Walla, where she is a rising senior at Whitman College, majoring in biology and minoring in chemistry. She loves cats, and spent 6 weeks last spring sailing around New Zealand. Tori is from Baton Rouge, Louisiana and graduated with a degree in Marine Biology in May 2018 from Nicholls State University in Thibodaux, Louisiana. Prior to Sound Experience she have worked at Project Transformation - a non-profit organization in the Dallas, Texas area- where she got to know and work with children in grades K-12 in low-income communities. Besides working with kids, another passion of Tori's is competitive jump roping! Lena is returning for for second season aboard the Schooner Adventuress. She was born and raised on the shores of the Salish Sea and looks forward to sharing her love of the marine world and all things sailing. For the last year Lena tried her hand at a "land job" teaching environmental science and conservation in elementary schools in Western Massachusetts and is now excited to be back on the water in the Pacific Northwest. Katharine has a VA Bachelor of Science in Biology and minor in Anthropology from Longwood University Burgundy Style Consulting LLC. She recently worked as a Grape Harvest and Cellar Worker, processing grapes to make wine! Fun Fact: Katharine is a novice rollerskater! Amelia received her B.S. and B.A. in microbiology and international studies at Oregon State University. She is dedicated to learning more about the ocean and bridging the gap between science and the arts. A native of the Olympic Peninsula and a current Port Townsend, WA resident, Jesse has a long history aboard Adventuress. His work on ships include a trip across the Atlantic to the Azores and Morocco as on the square rigger Picton Castle, sailing as Second Mate aboard the schoonerLette G. Howard out of New York City and serving as Winter Mate on the Hudson River Sloop Clearwater. Jesse also works as an instructor for the Hurricane Island Outward Bound School. He has several prolific spots for finding chanterelles—and he is happy to bring you there for a picnic. Amber is from New Jersey and recently finished graduate school studying biology with a concentration in marine conservation. This is what drew her towards environmental sailing. Be it beaches, boats, or diving; she love being around water. 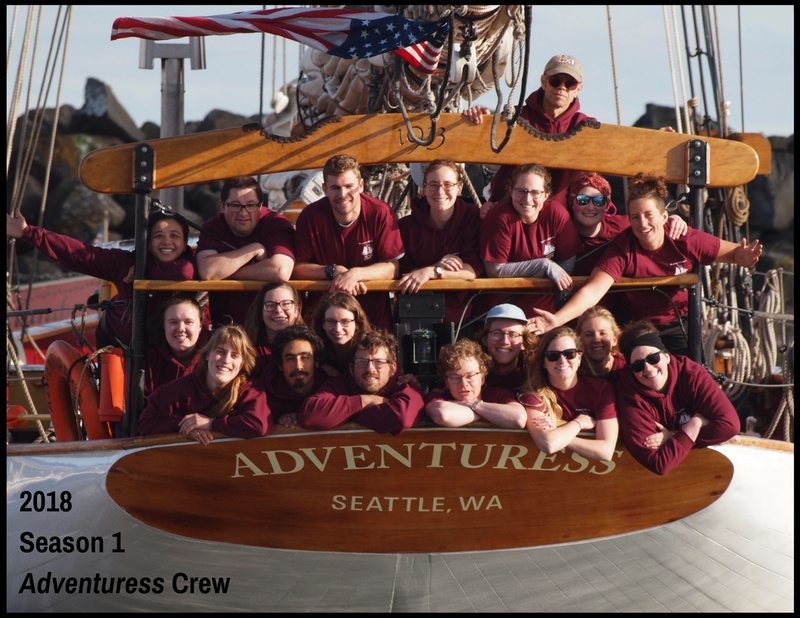 This is Claire's second season on board Adventuress. She grew up in Redmond, Washington and has a degree in Environmental Science from Western Washington University. Claire loves to travel, and is always thinking about the next place she can explore. One of her favorite experiences to date was coming nose to nose with a sea lion while snorkeling in the Galápagos islands. Miranda was born and raised in lovely Pasadena, California.She studied Neuroscience and minored in both Arts Administration and Studio Art at Skidmore College. She is now putting that degree to work by sailing on Tall Ships! Most recently she worked on SEA Semester's Robert C. Seamans as a deckhand for a yard period in American Samoa. She can currently count to 10 in four different languages and would be open to learning more. Sam grew up in Southern California. She learned about tall ships as a high school student aboard the Tole Mour and has been involved in boats ever since. This is her second season working for Adventuress, having filled the Relief Engineer position last Spring. Sam has completed maritime Basic Safety Training, is an AB and a Wilderness First Responder as well as being CRP and First Aid certified. Her most recent accolade is a shiny new captain's license. Sam hopes her next adventure to be working for the Foreign Service. If that doesn't happen then she plans to apply to International Relations graduate programs in the Fall. Emma grew up sailing small boats around Seattle and on the Potomac River. She currently calls the Methow Valley home, but before that lived in Bellingham where she received a BS in Environmental Science with a focus in Marine Ecology and Sculpture from Fairhaven College. Most recently she worked for the WA Dept. of Fish and Wildlife collecting biological data on salmon. The last time she was on the Adventuress was as for a Fantastic Voyage almost ten years ago, and she is very excited to be back. Fun fact: She raced two-person sailboats two years in a row at ICSA College National Championships with the Western Washington University's Women's Sailing Team. Maris is from Maltby, Washington, but has spent the last few years up in Squamish, BC getting her Bachelor of Arts and Sciences at Quest University Canada, where she asked the question "Where does the Artist Fit?". She was a deckhand aboard Adventuress a few years back, but has spent the last year working as the Volunteer Coordinator and breakfast cook at the Grunewald Guild in Plain, WA. When she can find the time, you can find her in the studio, either playing with metal or her loom. Anna grew up in Piedmont, California and still call the East Bay her home. In 2016, she earned her B.S. in Earth Systems (Environmental Science) at Stanford and since then she have worked a couple jobs as a field tech and have been sailing with Sea Education Association as a deckhand and assistant steward. A fun fact about Anna is that she have a twin brother who looks nothing like her! Maddy is from Vancouver Washington and recently received her Bachelor's degree in Oceanography with a focus in chemistry. She has previously been a barista Starbucks and volunteered at the Pacific Science Center. Fun fact about Maddy is that she is a mirror twin. Matt is from San Diego! He is finishing up his Parks and Recreation Management Degree this spring. Matt worked for Rites of Passage as a Field instructor for at risk youth. Victor is from Salt Lake City, Utah and just got his associates of science degree from Salt Lake community college. He plans on taking a break from school and then continuing to get a degree in aerospace engineering. Just before the Adventuress he was a lift operator at Solitude ski resort in Utah. He is half Swedish and speaks the language pretty well. Biz grew up in North Carolina and has a degree in design from the University of Southern California. Most recently, she has been splitting her time between the SSV Exy Johnson and the SSV Corwith Cramer. When not sailing, she can be found practicing yoga, taking photos, or shredding the gnar. Anna is from Bothell, Washington and has a Bachelor of Arts in Biology and History (and a minor in French) from Luther College in Decorah, Iowa. She's previously worked as a Newborn Hearing Screener for Pediatrix Medical Group. Fun Fact: Anne plays the bagpipes for the Keith Highlanders Pipe Band. Matt is from Moraga, California and has a B.S. in Environmental Science from University of Redlands. He's most recently worked at EnviroNova in San Francisco and enjoyed working in Zion National Park for an AmeriCorp position. Fun Fact: Matt has fed Blue-eyed Black lemurs at the Oakland Zoo while he worked there! From Philadelphia Pennsylvania. Marine Biology (B.S. Maine Maritime ’11 200ton Mates Near-coastal). Infrastructure Management (M.A. University of Washington ‘17). Surface Warfare Officer/ Weapons Tactic Instructor United States Navy – 7yrs (Shellback ’11). Kate’s a regular volunteer at the Issaquah Salmon Hatchery and has a particular soft spot for cold water invertebrates. She’s ready to learn more about hauling on some lines instead of just firing up the “Dee-sail”. Alexander is from Kirkland, WA and is studying to get his Bachelors of Science in Marine Biology at Nova Southeastern University in Florida. Fun Fact: Alexander sailed 7,000 nautical miles across the Indian Ocean last fall! Erica is a current graduate student in Earth Systems at Stanford University. She considers the undergraduate educational sailing trip she took in the Pacific to be one of the best experiences of her life. She hopes to be a teacher one day and is excited to get to teach and learn on a boat! Addie is from Philadelphia and is currently studying public health and environmental biology at Tulane University in New Orleans. She ate a slug when she was three years old and, although she’s a vegetarian now, has been intrigued by the outdoors ever since! Addie first came to Adventuress last summer during her gap year, during which she also lived on a horse farm in upstate New York, shadowed doctors in the Dominican Republic, and spent a month traveling across France. Addie is a member of Tulane EMS (and will be a certified EMT this fall! ), a Chaser on the quidditch team, and a peer health educator. For the 2017 Adventuress Crew, click here. 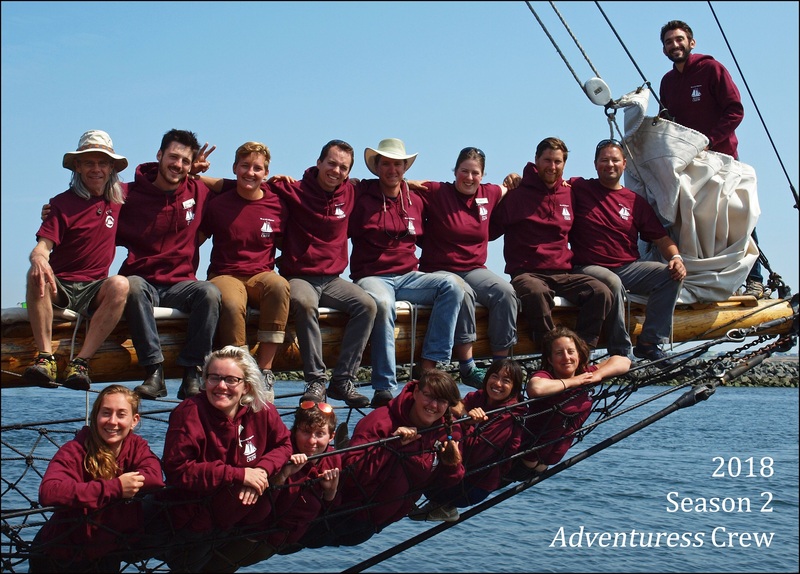 For the 2016Adventuress Crew, click here. For the 2015 Adventuress Crew, click here. For the 2014 Adventuress Crew, click here.